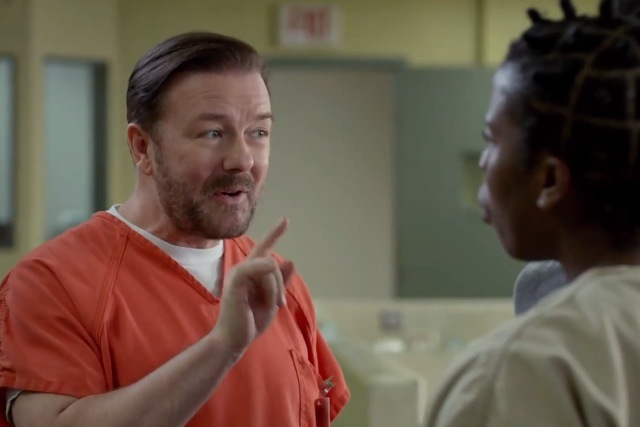 TV "superfan" Ricky Gervais is so in love with US drama that he imagines himself appearing in various Netflix series, including 'Orange Is The New Black', where one of the inmates calls him an "ugly bearded lady-man". The 75-second "Superfan" spot, which went live on the eve of this week’s Emmy Awards, features Gervais also appearing in scenes from ‘House of Cards’ and ‘LilyHammer’. The film starts with the comedian sitting on a sofa in front of his TV and addressing the camera. "You know when you’re watching your favourite Netflix shows," says Gervais, "and after five straight episodes it’s like you wanna be in it?" He then enters various scenes from Netflix shows, having an awkward encounter with Steven Van Zandt's mafioso from 'Lilyhammer' and a scuffle with two of the inmates from ‘Orange Is The New Black’. "You see, that’s what got you here in the first place – attitude," he says to the prisoners, sparking an angry response. "Attitude?" replies one of the inmates in a faux-English accent. "Where you from?" "Originally Reading, but then I moved to London…" Gervais replies. Will Netflix topple TV's House of Cards?